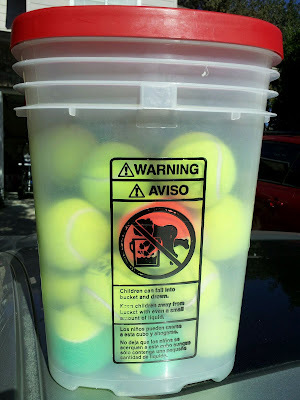 We bought a new bucket of practice tennis balls yesterday before we headed out to play. 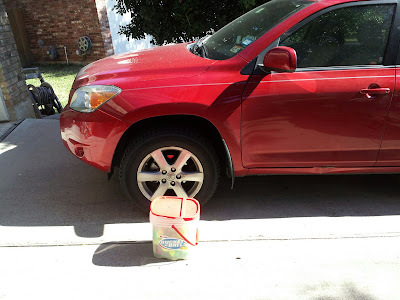 Eli 10.5 wanted the bucket with him in the back seat, and while we were driving to the courts, he was trying to open it up (more difficult than it seems because of a realtively stubborn plastic tear strip). "CHILDREN CAN FALL INTO BUCKET AND DROWN. KEEP CHILDREN AWAY FROM BUCKET WITH EVEN A SMALL AMOUNT OF LIQUID." FUTURE OLYMPIC GYMNASTS OR CIRCUS PERFORMERS COULD DO A PROLONGED HEADSTAND IN THIS BUCKET AND DROWN. PROTECT ACCORDINGLY. ALSO, DO NOT SWIM IN BUCKET UNTIL AT LEAST FORTY-FIVE MINUTES AFTER EATING.